The gym hall at Inverclyde Academy has more than 40 children in brightly coloured t-shirts whooping, leaping, running, shooting and scoring. It's the netball part of the Games Celebration week at Ravenscraig Community Sport Hub. Robbie Cuthbert is taking a note of the numbers and watching the young coaches deliver the sessions to the boys and girls. The 27-year-old is Inverclyde's community sport hub development officer. He used to be a strength and conditioning coach at the Sport Scotland Institute of Sport but was attracted to his current role by the excitement of the Commonwealth Games and what they might help him generate in one part of the country. Against a backdrop of excited screams in the gym, he tells BBC Scotland: "We've got four main sports this week - athletics, hockey, basketball, netball. "The sports are being delivered by local clubs. We've had a load of kids come down, more than 50, in fact. "It's great to see them having the opportunity to try a sport for free. It's funded through Sport Scotland and Inverclyde Council. "One of the aims is to get new members for the clubs. We hope some of them will fall in love with a sport and keep it going after school or at the weekends." Community sport hubs extend across Scotland. Their purpose is to bring various clubs together so that they can benefit from better training and coaching facilities and pooled resources. The Ravenscraig hub in Greenock comprises Inverclyde Athletics Club, Greenock Hockey Club, Clyde Cavaliers and Clyde Netball. There are two other hubs in the local authority, at Gourock Park, which offers cricket, bowls and tennis, and at the redeveloped Parklea in Port Glasgow, which offers grass and all-weather football pitches and new changing facilities. Cuthbert adds: "Some clubs are good at one thing, some are good at other things. "It's a question of sharing good practice to see how we can strengthen the sporting infrastructure within the local community." He hopes to use the new school at Port Glasgow Shared Campus to offer a wider range of sports than just football at Parklea, and has ambitions for hubs at Kilmacolm and Wemyss Bay. Cuthbert is part of a network of people working to deliver sport in the area. A key provider is Inverclyde Leisure, the local authority's sports arm. In addition, there are Active Schools co-ordinators such as Alison Dorrian, who has been in post for a decade, and rugby and football development officers who work with the schools and clubs. "I'm lucky. I get to work across all sports," says Cuthbert. "The buzz that Active Schools and the sports development team have drawn up for the Games and the legacy has been great." Another central figure is Gerry Gaffney, who has been involved in athletics for 47 years. He is president of Inverclyde Athletics Club, chair of Inverclyde Local Athletics Partnership (ILAP), chair of Ravenscraig Community Sport Hub and on the executive committee of Sport Inverclyde. 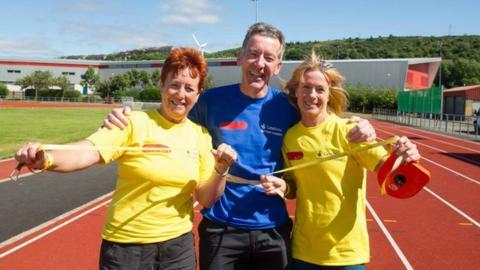 Gaffney and 16 other members of Inverclyde AC formed part of the Queen's Baton Relay when it came to the area. He set up four quad events, attended mostly by Inverclyde AC and Glenpark Harriers youngsters, across the summer to mark the Games coming to Glasgow. Further, he and charity fundraiser Chris Jewell have arranged for European Championships 1500m bronze medallist Chris O'Hare to attend their Dream Mile event on Sunday at Ravenscraig Stadium. At one quad, the children competed in a sprint, an endurance race, and jumping and throwing competitions. At another, they altered the running distance and replaced the long jump and shot-putt with the high jump and javelin. He is keen to explain how the ILAP and the local council work together to improve sports provision. "Inverclyde Council spent £1.7m refurbishing this track at Ravenscraig," he told BBC Scotland. "We needed more sand and covers for the long jump pit, we got it. We needed the shot putt circle cleaned, we got it. We needed the grass cut around the edge of the track, we got it. "The Council know they have a competent group at the ILAP that can be relied upon to run events and develop the young athletes." Cuthbert and Gaffney agree that the number of coaches and their quality are vital to sports clubs' success. "We can increase the amount of people that come to the clubs but we need to have the coaches there to deal with that," said the former. "We've set up a sports coach academy based around the young people within the clubs who were identified by the club officials as potential new coaches. "We told them we are willing to pay for their coaching qualifications and additional CPD but then they have to give back 'x' amount of hours per week. "Today we have four coaches from the netball club who are delivering the session. They now have four more coaches if they increase the numbers." It's a system that is welcomed by Claire Munn, a volunteer netball coach for the past 23 years and part of the Active Schools programme. "It helps to ease the burden," she says. "It's great to see these young women have the confidence to take the sessions."